Prevent your coffee machine from clogging and breaking down with this Dezcal Coffee and Espresso Machine Descaling Powder. Where hard, thick mineral scale in your hot water tank can ruin the brew temperature of your coffee, descaling regularly is the perfect solutions. Citric acid based, non-toxic and biodegradable, this removes build-up from your coffee maker. It is ideal for use on home coffee brewers and espresso machines. This box contains four packets of Dezcal descaling powder. 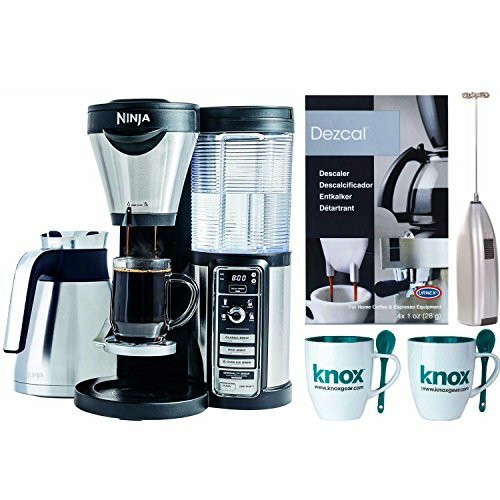 The Knox Gear Milk Frother uses a vibrating wire whip powered by (2) AA batteries (not included) to turn your milk or cream into a perfect frothy foam. Enjoy your favorite hot drinks without searching for a spoon. With the conveniently built in spoon holder of the Knox Gear 16 ounce mug, it's here to stir. Ninja’s patent-pending brewing technology is designed to deliver better coffee with variable richness levels that are never bitter. Only the Ninja Coffee Bar brewer has Thermal Flavor Extraction, which truly unlocks the full flavor potential of your coffee using automated controls for Temperature Calibration, Pre-infusion & Coffee Saturation. You can brew into any cup. At the touch of a button, Thermal Flavor Extraction lets you to dial up flavor richness from Classic Brew to Rich Brew to Over Ice Brew . The double wall vacuum sealed thermal carafe of 43 oz. will keep your drink hot for up to 2 hours.